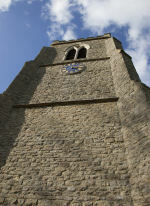 St. Catherine's Towersey is a member of the Oxfordshire Diocesan Guild of Bellringers, South Oxon Branch. We are one of only a handful of 4 bell towers in the UK. We currently practise every Wednesday and meet in the tower at 7:30pm. This is open to anyone would like to come along and see what church bell ringing is about and there is often the chance to have a go yourself if you would like. © 2014 - 2019 Andrew Gillard - All Rights Reserved.